Nikka, Japan’s second largest distiller, was founded by Masataka Taketsuru, the man generally credited with starting Japan’s whisky industry. Perhaps as a result of Taketsuru’s early training in Scotland, Nikka’s style tends to be slightly more “scotch-y” than their rivals Suntory. 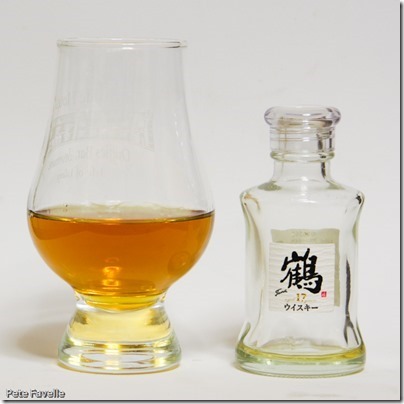 This is Nikka’s Tsuru 17, a whisky which is not readily available outside of Japan. Happily, I picked up a miniature on our last trip there! Bottled at a relatively low 43% ABV, it’s a gloriously rich-looking golden dram. The nose is very sweet, quite light and sugary with a subtle but warming alcohol edge to it. There’s the barest hint of damp wood and over time, a sweet clementine citrus tone appears. Watered, the sweetness is reduced and the fruit becomes fresher, greener – pears or even under-ripe strawberries. In the mouth it’s honey sweet on the tip of the tongue, with a touch of hot pepper coming through. It’s creamy smooth with hints of vanilla, and a slight grain bitterness right at the finish. Water mutes the sweetness, and brings a fruity, pear nature to the front. The pepper remains, and it’s still gloriously creamy but without that bitter edge. A delicious dram that’s worthy of 4 stars – if only I’d bought a bigger bottle! I have a 760ml white decanter of theTsuru. It is still sealed. I believe it has been in my grandfathers possession since the late 60’s or early 70’s. Is it still good? The only way to be sure is to open it! That said, whisky doesn’t really go off; I’ve been lucky enough to be given a few pretty ancient bottles, and they’ve been fine.